In the 1950s-1960s, USAF colonel and military strategist John Boyd developed a decision cycle model for how individuals and organizations react to external events. His OODA loop model proposed that we all execute four core steps: we Observe (the environment), we Orient (form a mental model with implicit hypotheses), we Decide (commit to a particular hypothesis and course of action), and then we Act (Observe-Orient-Decide-Act). Also critical to Boyd’s model was his insistence that the ability to run your OODA loop faster and more efficiently than your opponent at critical moments in the competition-cooperation landscape, and thus arrive first at more appropriate decisions and actions, is key to winning in competitive environments. The OODA loop is thus a version of the Shewhart-Deming OPCDA cycle that stresses speed and efficiency of thought and action, and continual operation of the cycle. Boyd himself saw the parallels between the two cycles when he discovered Deming’s work in the 1980s. Speed of the OODA loop is the paramount factor for Boyd. While he was a USAF Weapons School instructor pilot, Boyd was nicknamed “Forty Second Boyd”, for his bet that beginning from a position of tactical disadvantage, he could defeat any opposing student pilot in less than 40 seconds. 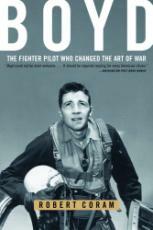 Boyd’s key strategy was faster use of his own mental OODA loop in air combat maneuvering. He had better knowledge of a few key Acts that might flip positional advantage, and due to his special training could more quickly Observe, Orient, and Decide when to use them. Boyd later went on to show that in situations where such “40 second” shortcuts to victory don’t exist, faster OODA loops may be needed in all relevant environments: including air, sea, and land. Lack OODA superiority in any one of these, as the US did on land against the Viet Cong in the Vietnam War, and you may face stalemate or failure, even if you have overwhelming OODA superiority in air and sea, as we did. Boyd’s OODA loop model became increasingly popular with military strategists during his lifetime, and he helped develop the rapid deployment strategies of the First Gulf War. Today his model is used in many other conflict domains where speed and efficiency of decision and action and rate of real-time learning are critical to conflict outcomes, including intelligence, security, sports, business, and litigation. Great books on Boyd’s contributions are Robert Coram’s biography, Boyd (2004), for Boyd on business see Chet Richard’s Certain To Win (2004), and for military strategy, Frans Osinga’s Science, Strategy, and War (2006). See software engineer Steve Adolph’s 2006 article applying the OODA loop to agile software development. To approach Boyd’s insights from the perspective of human civilization as a system, see my article on STEM compression, a physical way to use the OODA loop to model our planet’s leading processes of accelerating change. The Cynefin Framework of complexity scholar and consultant Dave Snowden offers a powerful bridge between the work of Shewhart-Deming and Boyd. Snowden notes that in domains where causality and preferences are reasonablly well known and the rate of change is low, such as urban planning or mature industries, making plans and applying best practices using the OPDCA cycle makes the most sense. In domains where causality and preferences are unclear and the rate of change is fast, as in new software applications and many military engagements, a rapid OODA approach (what Snowden calls Probe-Sense-Respond or Act-Sense) will be more adaptive. See A Leader’s Framework for Decision Making (PDF), Snowden and Boone, Harvard Business Review, Nov 2007, for more on his model.